We love being DC wedding photographers. Photographing weddings and engagements in the Washington, DC, metropolitan area is a great job! There are, however, a few drawbacks. For one, taking pictures in and around the Nation’s Capital means that we do not often get to use our DJI Mavic Pro drone. Unfortunately, security regulations prohibit flying drones within 15 miles of Ronald Reagan Washington National Airport. We do sometimes get to take beautiful pictures of fiancés and newlyweds from above. But that only happens when they choose wedding venues or engagement photo session locales in areas at the edges of the Washington metro area. Northern Virginia’s wine country is great for this. It is a beautiful region full of lovely and rustic wedding venues within an hour’s drive of downtown Washington. The rest of the time, however, our drone must sit idle. Every Washington, DC, wedding photographer understands the need for greater security in the city we call home, of course. It is a shame that drone photography is prohibited, though. It opens up a whole new world of possibilities for DC wedding photographers. It allows us to document the love that has brought two people to the altar from completely different angles than the ones we get with our cameras. Naturally, we are always itching to use our DJI Mavic Pro to take stunning aerial pictures of our wedding and engagement clients. It is one of many reasons why we love to travel to photograph out-of-town marriage events. The same restrictions do not apply outside of the DC metro area. So when the bride and groom in this particular image hired us to take pictures of their nuptials near St. Louis, Missouri, we could not wait. We eagerly looked forward to posing them in ways that would make for some great pictures when taken from above. As it turned out, this was not actually the first drone photo that we took during their marriage celebrations. They had a lovely wedding ceremony at St. Rose Catholic Church in St. Rose, Illinois. Afterwards, the newly married couple asked us to take a picture of everyone in attendance outside the church. However, we were unable to get all of the approximately 100 wedding guests in the frame from ground level. So we decided to use our drone to get an angle in which no one was blocking anyone else. It was a lot of fun as it was taking those group pictures. The wedding guests hammed it up and made faces to entertain the bride and groom. That said, however, the beautiful picture featured here was our favorite drone shot of the day. The bride and groom chose to have their couples portraits taken at Southern Illinois University Edwardsville. That institution of higher learning is located about 20 miles from St. Louis. They met while studying there, which made it an integral part of their love story. We started by capturing some stunning images of them embracing and kissing under some cherry blossom trees in full bloom. Then we moved on to the drone shots. First, we asked them to lie down in the middle of a brick ellipse located near the university’s main entrance. One of the things we have learned from experience is that couples look best in drone photos when posed lying on the ground. When photographed that way, their faces (and the love and emotions visible on them) can be seen more clearly. Then we hovered the drone above them and clicked away. There are two things that we particularly like about the pictures that we took of these newlyweds. The first is how visually appealing they are. The oval, the paths radiating out from it and the deep green of the surrounding grass look very nice. The ellipse frames them perfectly. 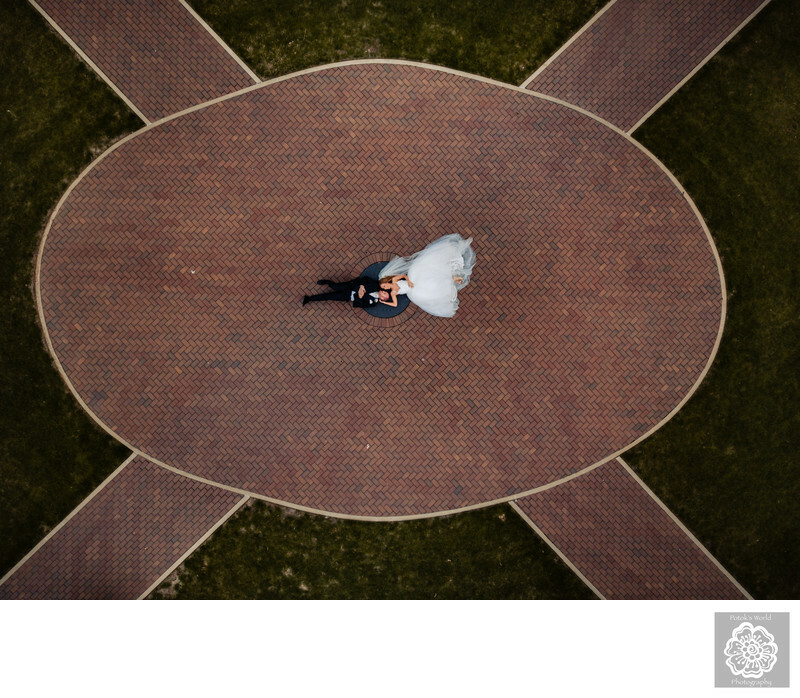 The walkways effectively point to and make the couple the center of attention. The color of the grass contrasts beautifully with the red-orange of the bricks. The second thing we like is the way that the bride is establishing a physical connection with her new husband. By stroking his cheek, she is showing the care and love that she feels for him. Little elements like that do such a great job of demonstrating the feelings that brought them together in the first place.